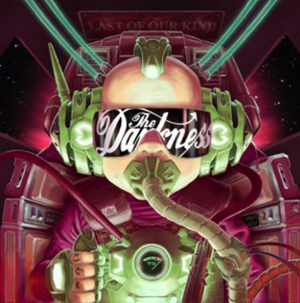 Summer 2015 sees the return of multi-award winning music band, THE DARKNESS. A new track, “Barbarian”, is currently manfully straddling the information super highway and is a palate cleanser for their fourth album, Last Of Our Kind, produced by guitarist Dan Hawkins. Penned in Ireland, where the band play a small but perfectly formed tour next month, the record is bursting with the very finest rock-based music available to mankind, as one might expect. Check out the video for "Barbarian" right HERE. Out June 1st, Last Of Our Kind will be released in partnership with Kobalt Label Services and is the first album to feature new drummer Emily Dolan Davies. She replaces original drummer Ed Graham who departed in mysterious circumstances. Having been drumming since 1999, Emily has played with everybody from the likes of Bono, Bryan Ferry and TRICKY. Now she has shown herself to be equal to the ultimate music challenge. Last Of Our Kind is the meaty and impassioned follow-up to 2012’s Hot Cakes, which saw the band reunited having enjoyed a well-publicized and well-deserved hiatus. As distinguished guests of DEF LEPPARD, THE DARKNESS destroyed Download Festival in 2011, then waved goodbye to their loved ones and toured planet Earth for over 18 months. They rounded off 2013 with a celebratory tour marking the 10th Anniversary of their legendary number one debut album. Permission To Land featured the classics “I Believe In A Thing Called Love”, “Love Is Only A Feeling”, “Love On The Rocks With No Ice” and “Love Is A Many Splendoured Thing”; it was the fastest selling debut album by a British band in America since that of THE SPICE GIRLS. Last Of Our Kind will be released on limited edition colour vinyl, CD and downloadable computer files. THE DARKNESS will be announcing more touring plans for later this year very, very soon.